In case you hadn’t already noticed, Apple announced OS X Mountain Lion earlier today, its latest operating system for the Mac which will make its public debut this summer. Mountain Lion will further increase the iOS influence on Apple’s desktop operating system, with the arrival of features like Notification Center, Messages, and Notes. But for gamers, undoubtedly the most exiting new feature will be Game Center’s arrival on the Mac. With promises of cross-platform multiplayer and the ability to rack up achievements on both your Mac and iOS devices, this is set to create a new bridge between mobile and desktop gaming that will revolutionize cross-platform play. Like many Apple products, this is something that should have been done a long time ago. Gamers have been waiting too long for a system that allows them to play online multiplayer with their friends wherever they may be on whichever device they have with them. Sure, there are a small few titles out there that already support cross-platform multiplayer, but there aren’t anywhere near enough. Game Center will change that. 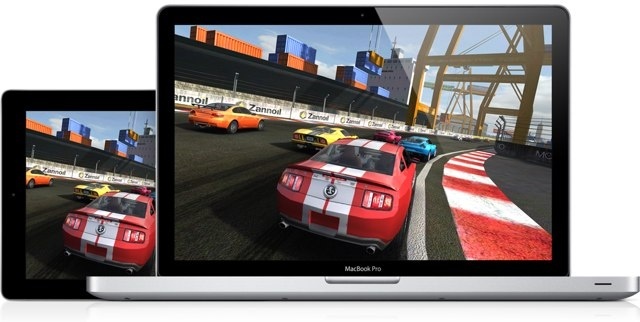 By the time we’re all running Mountain Lion next summer, the biggest titles on Mac and iOS will support cross-platform play. And just think what this will do for cross-platform play. Imagine joining your buddy online for a few laps in your favorite racer while one of you is at home on a Mac and the other is on the train home from work on their iPad. And imagine what developers could do with this. How about different roles for different devices? How about playing a first-person shooter on your Mac while your friend controls air support from an iPad right next to you? It’s not just online multiplayer, either. You can now share leaderboards and achievements between your Mac and iOS devices. No longer will you have to earn the same achievements or high scores in the same game on two devices. Get them on your iPhone and they’re there for all your friends to see — no matter which Apple device they’re using. This is incredibly exciting stuff and it’s all possible now that Game Center is coming to the Mac.